Nanotechnologies have already made water-repellent textiles possible. 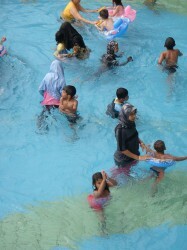 In many countries Islamic countries women experience difficulties when it comes to swimming: They either have to remain on shore or go into the water wearing their headscarf and other clothing. Our idea is to use the water-repellent properties of nanomaterials and develop textiles that do not get wet in contact with water. Such clothing would allow Muslim women to visit beaches, swimming pools or open-air baths – without compromising their religion. In many Islamic countries, in Turkey for example, many women decide to go into water in complete clothing. Many others bring their families to bathe, remain however themselves seated by the pool edge. Why – wearing wet clothes is not only uncomfortable but can make one sick, too. Water-repellent scarves and clothing would allow them to enjoy the water too and build bridges between religion and society.